Real Numbers: What are Real Numbers ? Numbers which can be quantified and represented by a unique point on the number line are called real numbers. Every point on the number line represents one and only one real number. The set of Real Numbers are denoted by “R”. The decimal expansion of a real number is either terminating, repeating or non-terminating and non-repeating. • Rational numbers: Numbers of the form p/q, where p and q are integers and q≠0. Decimal expansion is terminating or repeating. 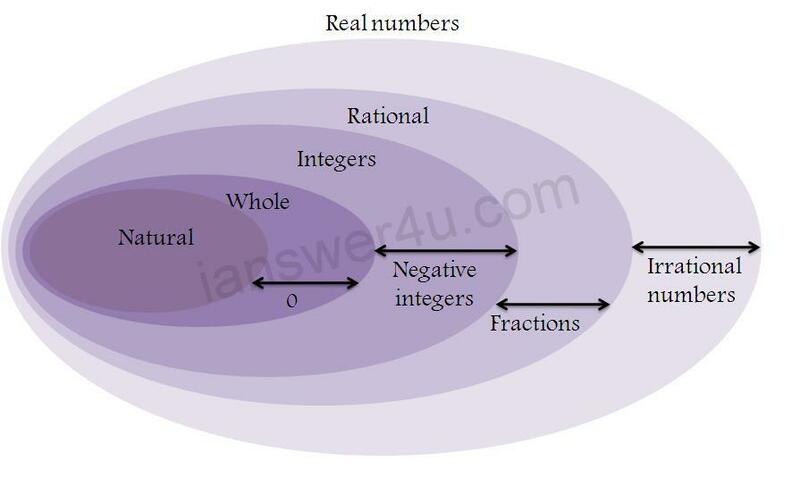 • Irrational numbers: any real number which is not a rational number is an irrational number. Decimal expansion is non-recurring and non-terminating. • The sum of a rational and an irrational number is irrational. For example: 3 + √3 = 4.73205…., which is irrational since it does not follow any specific pattern and goes on endlessly after the decimal. • The difference of a rational and an irrational number is irrational. For example: 3 - √3 = 2.73205…., which is irrational since it does not follow any specific pattern and goes on endlessly after the decimal. • The product of a non-zero rational with an irrational number is irrational. For example: 3 × √3 = 5.19615…. which is irrational. • The quotient of a non-zero rational with an irrational number is irrational. For example: 3 ÷ √3 = 1.73205…. which is irrational. @Anonymous Thanks.. Do send us your questions through Contact Us page.. Simple and concise. I really like your Venn diagram! EWW, This is so awesome!